Last Week in Review: The housing market continues to bloom, but there was mixed news from other parts of the economy. Forecast for the Week: The labor market will be front and center this week, along with key inflation and manufacturing news. View: Navigating personal and professional posts on social media is easy with the etiquette tips below. March comes in like a lion and goes out like a lamb. As March comes in this year, the housing sector continues to roar ahead with good news, while other sectors are struggling. Read on to learn the latest details, and what they mean for home loan rates. Despite the harsh weather, New Home Sales rose by 9.6 percent from December to January to an annual rate of 468,000, well above expectations. The 468,000 rate was the highest level since July 2008. Pending Home Sales for January also came in just above expectations and well above December's reading. In addition, research firm CoreLogic reported that completed foreclosures fell by 19 percent from January 2013 to January 2014, while the Case Shiller 20-city Home Price Index ended its best year since 2005. On the other end of the spectrum, the second reading for 2013 fourth quarter Gross Domestic Product (GDP) was, in a word, gross. GDP fell to 2.4 percent from the initial reading of 3.2 percent, sharply beneath the 4.1 percent recorded in the third quarter of 2013. The decline was due in part to consumer spending and exports that were less robust than initially thought, signaling U.S. economic growth remains choppy. However, there was some good news in the report as company spending was revised up sharply, suggesting an improvement in business conditions. In labor market news, weekly Initial Jobless Claims rose by 14,000 in the latest week, reaching a one-month high as the job markets continues their up and down pattern. The labor market has been choppy lately, especially after the anemic number of job creations in December and January. What does this mean for home loan rates? Remember that the Fed is now purchasing $35 billion in Treasuries and $30 billion in Mortgage Bonds (the type of Bonds on which home loan rates are based) to help stimulate the economy and housing market. This is down from the original $85 billion per month that the Fed had been purchasing. With the December and January job creation numbers far below expectations, the Fed will be looking closely at February's numbers for any signs of a pattern. If this report and other key economic data points are weak, the Fed may have to rethink the tapering it has begun. This story is sure to impact the markets and home loan rates as we move ahead in 2014. This week's economic calendar features a broad array of reports that span a big portion of the U.S. economy. Economic data kicks off on Monday with Personal Income, Personal Spending, and the inflation-reading Personal Consumption Expenditures. The ISM Manufacturing Index and the ISM Services Index will be released on Monday and Wednesday, respectively. Also on Wednesday, look for the Federal Reserve's Beige Book, which can serve as a helpful indicator to the Fed's decisions on monetary policy. In labor market news, the ADP Employment Report will be delivered on Wednesday, followed by weekly Initial Jobless Claims on Thursday. Worker Productivity will also be reported on Thursday. As you can see in the chart below, Mortgage Bonds had a strong week thanks to investors and some weaker than expected reports. 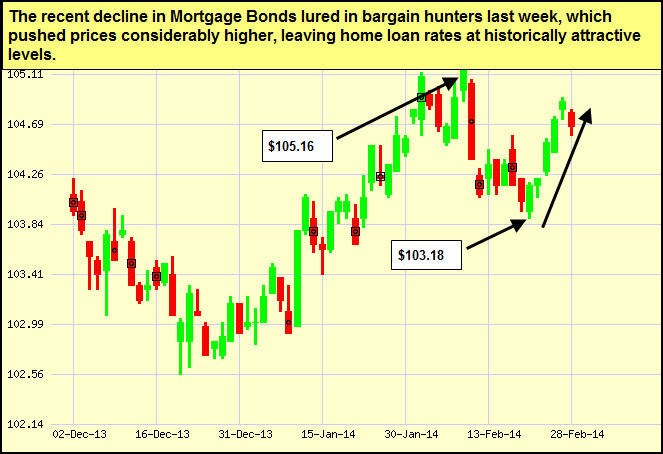 home loan rates remain near historical lows and I will continue to monitor them closely. How do you balance work and play in your social-media posts? By Susannah SniderSee my bio, Kiplinger.comNavigating between personal and professional posts on social media can be like walking through an etiquette minefield. Whether you're tweeting in 140 characters or posting family vacation photos to Facebook, it's tough to know which topics are off-limits. "The problem with social media is that it's relatively new," says etiquette consultant Jay Remer. "Using it properly hasn't really caught on yet. "Should I even bother? Your gut reaction may be to abstain from social media and avoid the issue, but that's not always smart. Social media is a useful tool. It can promote your business and personal brand, and it can help you network. If you're not on Facebook, LinkedIn or Twitter, it may appear that you're out of touch to a client or recruiter searching your name online. The nuts and bolts of all these platforms are similar you publish links, photos and comments but the expectations are different. A LinkedIn account is for your professional life. Facebook and Twitter give you more wiggle room, with the tone of your posts and bio helping to define them as professional or personal. Remember that objective before each post to keep your profile on-topic and appropriate. If your feed is for personal purposes keeping in touch with family and friends then tighten your privacy settings. But private or not, remember that posts and photos can leak, so err on the conservative side. Can I connect with the boss? Yes, depending on the platform. For example, LinkedIn is almost always appropriate because the site is for professional contacts. Following a professional page on Facebook is fine (you'll recognize a professional profile by its "likes" or "followers"). But don't "friend" a boss or subordinate. Twitter falls somewhere in between, because professionals may use it for networking or posting work-related links and comments. Take a cue from the kind of content a co-worker posts. And if you don't feel comfortable accepting a "friend" or "follow" request from a co-worker, you don't have to accept it. Can I post personal updates on my professional account? You should with a few caveats. A steady stream of professional posts can be boring and robotic. An occasional personal status update spices up and humanizes your feed. The trick is to draw the line between sharing and over sharing. Choose a topic or twosay, biking and music and restrict lifestyle posts to those subjects. Your followers will know what kinds of personal updates to expect from you without feeling overwhelmed by intimate details. Reprinted with permission. All Contents 2014 The Kiplinger Washington Editors.